We are excited to offer an invitation to attend P.E. 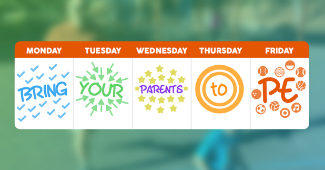 class with your child(ren) during the week of September 24-25. This is “Take Your Parent to P.E. Class” week and we would enjoy having you be a part of our class. • Please do not bring siblings to class, no matter what age. There won’t be enough room, and we want everyone to be safe. • Please make sure you know the Enrichment schedule for the week of September 24-25 so that you may attend the correct class with your child. If your child is a Traveler, please attend the class scheduled for travelers. This invitation is for PE Class with Mrs. Stranahan and Mr. Yaeger. • Stop by the office first to obtain a badge so that you may go to the gym. • We ask that you only attend PE class. If you are planning to attend lunch with your student on this day, please let the office know when you check in. Parents are encouraged to participate with their children during this time. We look forward to seeing you in our classes soon. If you have any questions, feel free to email us or call.